Why does Oberlo delete a product on its own??? It happens already second time, that in the morning I see a message: "Oberlo deleted a product". Why does it happen? And why does Oberlo do something without permission? I also wanna know about it. @Magda Could you figure it out, why it happens? Thank you! Hey Spesius sorry to get back to you so late. Not sure how this slipped my radar! The only way Oberlo can delete your products is through permissions set in the Auto-Updates. If the product reaches 0 quantity or is removed from Aliexpress, Oberlo has an option to have it removed in Oberlo too. Not sure what yours are set to, but I would suggest checking that out first. You can find it by hitting Settings in the bottom left corner of your Oberlo app and scrolling down. 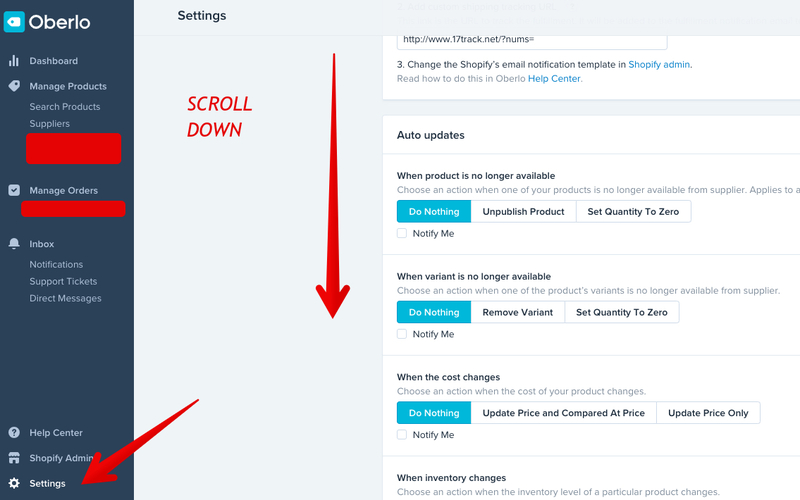 There you should be able to turn this setting off so the product is not removed! Magda Hey, I already wrote to support and they made it clear for me... Thanks!